A Day In The Life...: To swing or not to swing? o wow ... if i had a big enough back yard ... i'd totally do it!! my boys NEED something like that! I don't envy you the excavating and the leveling, etc. You could always talk to Kelly. We didn't like our options and so he built one using a kit from Home Depot - it turned out to be the best option for us. Ben's parents put up a swing set almost just like that recently. 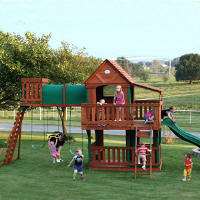 The kids spend all day outside building forts inside the swingset and having picnics. Go for it! !